Introduction: Peroral endoscopic myotomy (POEM) has been applied and is emerging as a less invasive outpatient procedure for the definitive treatment of achalasia. Very few surgeons have gained competency with POEM, and there are almost no available training opportunities. 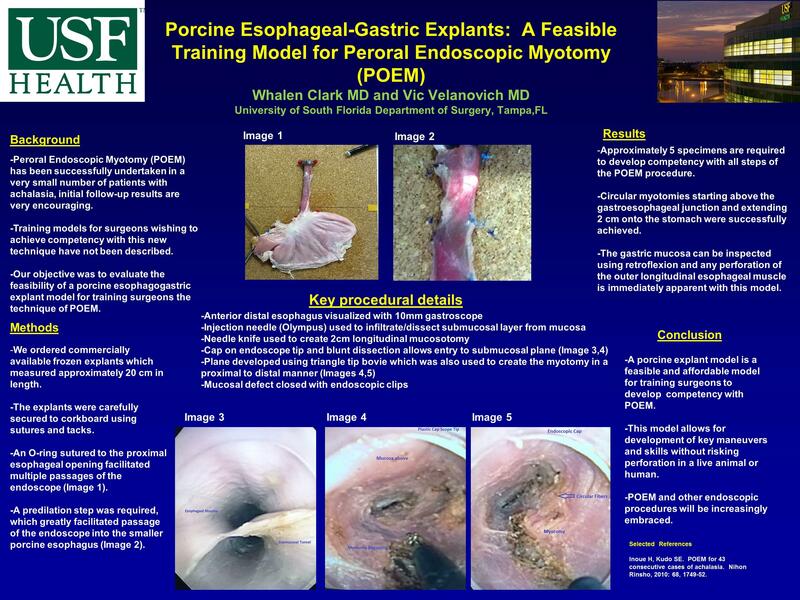 Our objective was to evaluate the feasibility of a porcine esophagogastic explant for training surgeons to complete the technique of POEM. Methods: En bloc esophageal-gastric porcine explants measuring approximately 20cm long by 2 cm wide were acquired and secured in place using prolene sutures(Image 1). The porcine esophagus required an initial predilation step before the endoscope would pass freely into the stomach. Using a 10 mm GIF-160 gastroscope equipped with an injection needle (Olympus), saline was injected into the submucosal layer of the distal-anterior esophagus. The needle knife was then used to create an approximately 2cm longitudinal mucosotomy. Next, a combination of blunt dissection facilitated by a cap on the scope and the blunt tip of the triangle tip bovie (Olympus) was used to develop a plane between the mucosa and underlying muscle layers. Remaining adherent bands were cauterized using the triangle tip bovie. A key maneuver at this point was to twist the scope to access the submucosal plane where dissection could be continued distally onto the stomach. The triangle tip bovie was then used to create a myotomy in the circular muscle fibers of the esophagus which could clearly be visualized. Extending the myotomy required longitudinal pushing of the bovie to effectively and completely divide the fibers(Image 2). Results: To competently complete POEM using this model, approximately 5 specimens were required. After the myotomy is made, inspection of the outer muscle layers can easily be made and similarly the gastric mucosa can be inspected using retroflexion with the gastroscope. Circular myotomies starting above the gastroesophageal junction and extending 2 cm onto the stomach were successfully achieved. Conclusions: A porcine explant model is a feasible, affordable model for training surgeons how to undertake POEM. This model provides to opportunity to practice key maneuvers before risking perforation and esophageal damage in a live animal model and should be applied as initial training. POEM and other endoscopic procedures will be increasingly embraced and this model might be useful for other endoscopic applications.